Q1. 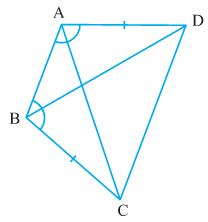 In quadrilateral ACBD, AC = AD and AB bisects ∠A (see Fig. 7.16). Show that Δ ABC ≅ Δ ABD. To prove: Δ ABC ≅ Δ ABD. Proof: In Δ ABC and Δ ABD. Q3. 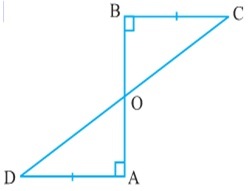 AD and BC are equal perpendiculars to a line segment AB (see the given figure). Show that CD bisects AB. 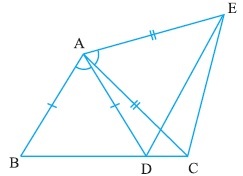 Given: AD and BC are equal perpendiculars to a line segment AB. To prove: CD bisects AB. Given: l and m are two parallel lines intersected by another pair of parallel lines p and q.
Q5. Line l is the bisector of an angle ∠A and B is any point on l. BP and BQ are perpendiculars from B to the arms of a (see the given figure). Show that: (i) ∆APB ≅ ∆AQB (ii) BP = BQ or B is equidistant from the arms of ∠A. 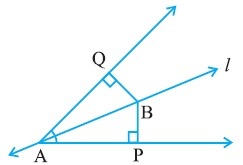 Given: Line l is the bisector of an angle ∠A and B is any point on l. BP and BQ are perpendiculars from B to the arms of a.
it can be said that B is equidistant from the A.
Q6. 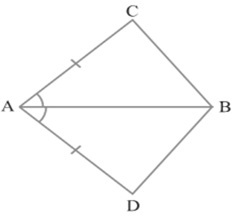 In the given figure, AC = AE, AB = AD and ∠BAD = ∠EAC. Show that BC = DE. Given: AC = AE, AB = AD and ∠BAD = ∠EAC. To prove: BC = DE. Q7. AB is a line segment and P is its mid-point. D and E are points on the same side of AB such that ∠BAD =∠ ABE and ∠EPA = ∠DPB (See the given figure). 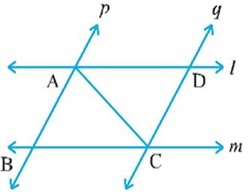 Given: AB is a line segment and P is its mid-point. D and E are points on the same side Of AB such that ∠BAD =∠ ABE and ∠EPA = ∠DPB.